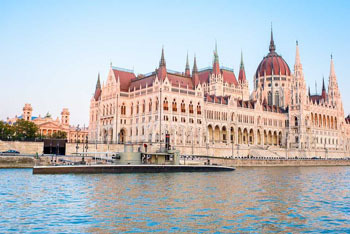 If you plan to visit Budapest in July you will enjoy a wonderful summer vacation in one of the best-value cities of the world. 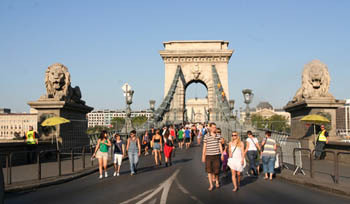 July is usually the hottest month in Hungary with daily temperatures reaching 30 – 35 ºC or higher with plenty of sunshine. a bottle of water with you when exploring the sights of the city. Summer storms with thunders and lightning are not unusual during this period of the year: they refresh the air after a long hot spell. July offers a couple of great festivals and events including concerts, exhibitions, and other spectacular events. The weather is perfect so many programs are held outdoor. Address: Városház utca 7., district V.
Summer evenings are ideal for open-air concerts. The courtyard of the Pest County Hall (Vármegye utca 15., distr. V.) in the city centre hosts a wonderful series of classical music performances by the Concerto Budapest ensemble founded in 1907 and a resident group of the Music Academy since 2013. Relax to the tunes of Mozart and Beethoven (in case of rain concerts will be held in the Aula Magna of the ELTE University at Egyetem Square 1-3. at 20.30). traditional dance shows by the Hungarian National Dance Theatre at a wonderful venue. See more at their website! This summer one of the most beautiful bridges of Budapest, the Liberty Bridge turns into a colorful festival place on 3 weekends. The whole bridge is for the pedestrians, the southern sidewalk is only for bicycles. No cars or other vehicles are allowed including trams No. 47, No. 48 and 49. See details of the traffic changes here. The event is part of a very popular project called Szabihíd, started in 2016. The aim of the project is to use the whole bridge as a public place without any motorized traffic. July is a busy month in the schedule of the 3-month Summer Festival that began in June. The festival celebrates its 80th anniversary with outstanding programs. Children programs (free of charge) take place at the Interactive Story Theatre opposite the entrance of the theatre and the Renaissance Mornings on Sundays at 10.30 at the St. Margaret Monastery Ruins. Budapest has many great concert halls, churches where you can enjoy classical concerts all the year round. TIP: You can bump into short summer concerts for free at prominent locations across the city (Basilica, Gerbeaud Terrace., Margaret Island, Vajdahunyad Castle etc.) till 12. August. The Vajdahunyad Castle is a mock castle in City Park (Városliget) that provides an ideal background to romantic summer evening concerts. The fortress is a copy of castle located in Transylvania under the same name. 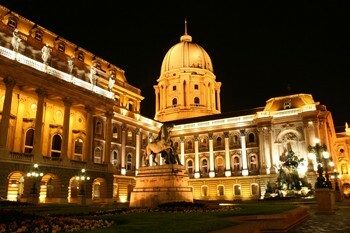 Besides being a cultural monument, the building gives home to the Hungary’s Ministry of Agriculture and its museum. Budapest Gypsy Symphony Orchestra and a few more. The summer concerts start on Monday and Thursday at 20.30. 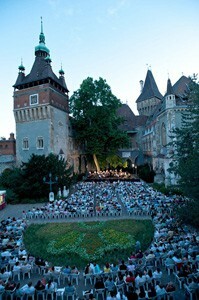 View the concert schedule of Vajdahunyad castle Summer Music Festival. Music Evenings in the Zoo, 04. July – 22. 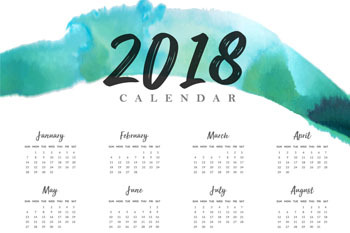 August, 2018. The Budapest Zoo and Botanical Garden hosts summer evening concerts each year. Jazz, klezmer, and other light music concerts welcome music lovers on Wednesday evenings, starting at 20.30 (gates open at 19.00 so you can take a strool in the zoo before the performances with your ticket). Good music, exceptional setting, light summer breeze… what else do you need to have a memorable summer evening? See more on the official website of the festival. If you wish to learn about Hungarian wines and wine regions head for a new place just off Váci utca. and from more then 150 different bottles on display to purchase (worldwide delivery is available, no need to carry the bottles with you). Kind owners, expert sommeliers, a custom mobile application – all to best enjoy our country’s finest wines. See tasting programs for individuals and groups. July is also a great time to explore the wine cellars in Etyek village just a short drive from Budapest in the Etyek-Buda wine region. 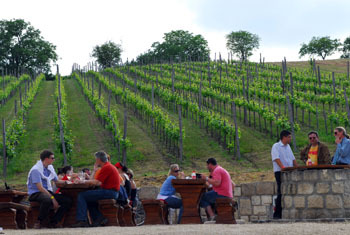 You can choose from several wine tasting programs (with cheese/chocolate tasting or a substantial Hungarian-style lunch/dinner). Friendly, English-speaking guides, fine wines and food, kind local people guarantee that you’ll have a fantastic time. Reservation is required (min. 2 persons). 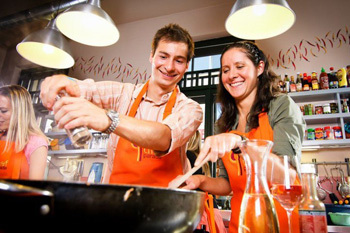 TIP: Cooking Courses – Learn to Make Hungarian Dishes! 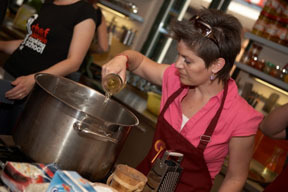 Join one our cooking classes to find out more about local cuisine and food specialties! You’ll prepare a 3-course Hungarian menu with the guidance of the friendly, English-speaking chefs. A guided visit to the famous Great Market Hall on Fővám Square can be included in the program. A great and fun way to see and experience a slice of local life in Budapest. The climate in Hungary is very favourable to growing a wide variety of vegetables and fruits. In summer food markets in Budapest are packed with juicy fruits (strawberry till mid-June, then raspberry, sour cherry, cherry, apricot, peach), and tasty veggies and greens. Besides the well-known markets, there are a couple of great craft food markets in Budapest where you can get gourmet food stuff, bio vegetables and fruits grown by local farmers. 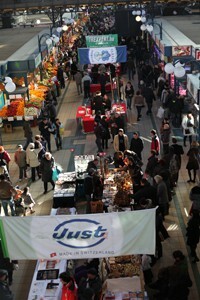 Each month a different nation showcases its gastronomy and culture in the Great (or Central) market in Budapest. 03 – 05. July: Indian days – culture, folk art, gastronomy. A river excursion is always a pleasant way to delight in the wonderful city scape. You can do it during the day, in the afternoon, in the evening or at night. Tours are available with or withour meal. Evening Cruise with Dinner/Wine Tasting/Craft Beers/cocktails – you can seep a coffee or tea while enjoying the beauty of the city. Cocktail/Beer and Cruise – have a fine cocktail or beer while on a 1.5-hour, late afternoon river tour. Night Cruise with Dinner – the city is even more wondrous when illuminated at night, a nice buffet dinner ensures a pleasant program. Book two activities for less! 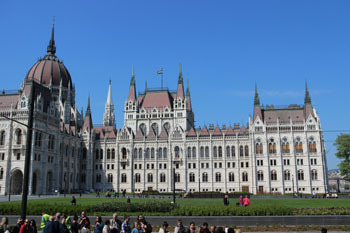 Do visit the largest building of Hungary dominating the Pest side of the Danube. a long pool in front of the building and lots more. Go on a guided tour (buy tickets online to avoid queuing for ticket) to see the most revered treasure of our country: the Holy Crown of St. Stephen. Cafe TIP: Try the new Szamos Cafe at Kossuth tér 10 for a coffee & cake break or a light lunch. TIP: The Historic War Ship Museum, Lajta will be anchored at the Parliament till 30. September. Visit the unique naval ship on an audio guided tour! The program can be combined with a boat tour on the Danube! If you don’t mind the heat go on a self made walking tour in Buda Castle Hill. Use our map-based itineraries to explore the attractions of the city’s oldest district on your own. The first fortress was built on top of the hill in the 13th century after the Mongol invasion. Most of the medieval buildings however had been destroyed during the many wars, sieges and fires, so most of the buildings date from the 18-19th century, but you’ll also find some architectural gems originating in the middle ages. A walk in the castle area will treat you with charming streets, some lovely restaurants, confectioneries, and a fine view of the city. the Baltazar Hotel, Grill and Wine Bar : a creative place offering gourmet street food, fine wines and luxury accommodation. 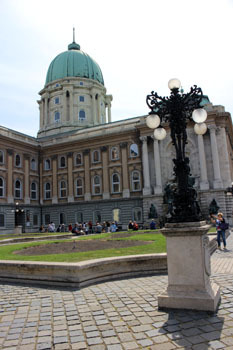 Address: Országház utca 31., Buda Castle, District I.
Budapest is packed with museums of all kinds as well as exhibition centres and art galleries. Wednesdays at 18.00 – 22.00. Besides wines, some great exhibitions complete the program. Live music adds to the atmosphere. 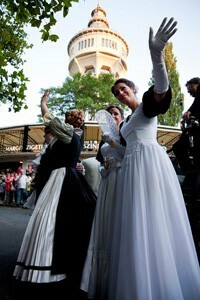 Scenic vista, a historic setting, delightful wines, exciting exhibits with guiding, dance performances and jazz concerts. A perfect program for a pleasant summer evening! This year the Wine Wednesdays’ main theme is colours: 4 colours and 4 talks about paintings. Music:| Árpishow: The prominent representatives of old school jazz will provide a delightful musical atmosphere for the Impressionist evening of our Wine Wednesday. Guided Tour at 18.30 – Ellen Mozley (volunteer guide) – Picture the Outdoors – Focus on Nature (information desk). Music: György Pataj Trio: György Pataj’s role model is Alfred McCoy Tyner, who made his name playing in John Coltrane’s epic jazz quartet. This musical milieu was deservedly picked for the Surrealist part of our Wine Wednesday series. Guided Tour at 18.30 – Ombretta Lazzeretti (volunteer guide) – Emotions of a Century: Friendship and Love (information desk. 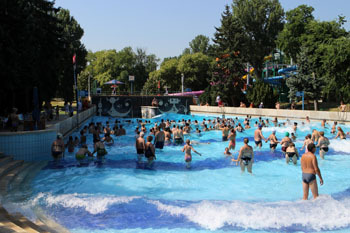 The best place to be in Budapest in July is in one of the handful of open-air baths and beaches. So don’t forget to pack your swimming suit (you can buy one here if you did) and head for the Széchenyi, Gellért or Lukács. For a Turkish bathing experience try the Király, Rudas, or the oldest bath of the our city: the Veli Bej. 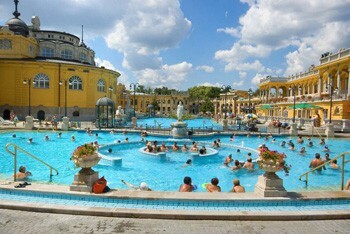 TIP: Skip queuing and buy your ticket to the Széchenyi or Gellért Baths online. Convenient and simple: no need to wait in the long line at the cashier, with your pre-purchased ticket you can enjoy fast entry at the separate welcome desk! 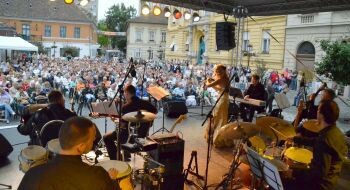 TIP: Summer Night Parties in the Széchenyi Bath: from 1st June till September you can have a great outdoor party in the bath every Saturday starting at 22.30. Tickets: from 35 – 60 EUR. Laser show, electronic music, lots of water fun ensure a fantastic summer night. On the Night of Open-Air Pools / Strandok Éjszakája, the last Friday in July most baths will stay open till midnight, some till 2 am or 4 am. Most baths will also have some special programs that’ll be posted on their websites. Admisssion to the Aquaworld’s Night of Baths is 2 700 HUF/prs. Program starts at 21.00 and lasts till 02.00 am. Address: Íves út 16. district IV., There’s a free bus service every day between 9.30-21.00 departing from Heroes’ Sqr. in front of the Hall of Arts. Outside Budapest – Red Bull Air Race, 23 – 24. June, 2019. The amazing aerial competition returns to the scenic Danube and its bridges in the Hungarian capital. Lots of acrobatic performances under and over the Chain Bridge (Széchenyi Lánchíd) on two days on the first weekend of July. 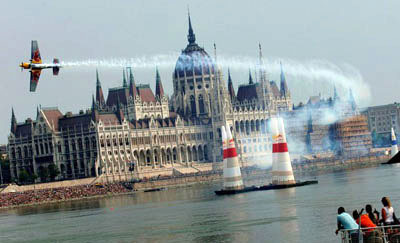 See details about the Red Bull Air Race Budapest. Try any of the following three Japanese restaurants: two of them are in the Jewish quarter, a vivid party and cultural centre of Budapest. the third one is Itoshii, an all-you-can-eat place on Teréz körút, close to the Nyugati Train Station. A new sushi bar, Japanika, opened in 2016 at the Basilica on Szt. István tér. Opening hours: Mon-Sun: 12.00-24.00. Besides sushi they have soups – miso, tom-yum, ramen – all sorts of salads, main dishes on the menu. The drink list is extensive too, with Japanese cocktail specilaties, international cocktails, Hungarian beers, pálinka and wines, fruit juices and soft drinks. The sultry July nights are ideal for outdoor clubbing. TIP1: Head for Gozsdu Court, in the Old Jewish Quarter. It is packed with cool bars, and garden clubs, cafes and restaurants. 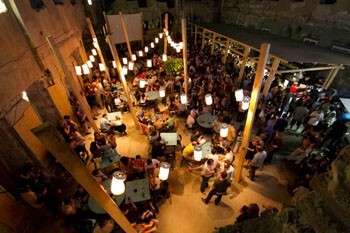 An awesome place for partying in the middle of summer in Budapest. TIP2: A Party on the Danube on the deck of a sightseeing boat is another fantastic place to be in July. Enjoy nightlife, and see the best views of the city illuminated at night. 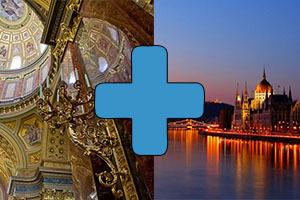 Drinks, sightseeing on the Danube and dancing for a memorable night out! A spacious club á la ruin pub style in downtown, with a small sandy beach in the back garden. It offers simple foods, a wide variety of drinks (beer, wine, cocktails, coffee, non-alcoholic drinks). The interior can take in several hundreds of people. The bar has a large bike storage place should you plan to get their on two wheels. 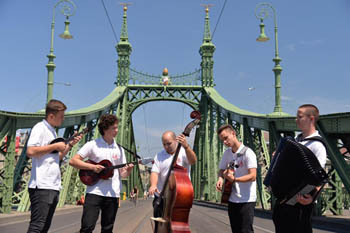 A very popular yet inexpensive open-air concert venue at the Buda end of the Rákóczi Bridge. This year they’ll have a very impressive concert series starting from the end of April. Address: Hengermalom út 52. district XI.